If you wanted to go from the end of The Hobbit I think the ring would be your inevitable choice as the link. If you wanted a large tale, the Ring would at once acquire a capital letter; and the Dark Lord would immediately appear. As he did, unasked, on the hearth at Bag End as soon as I came to that point. So the essential Quest started at once. As one can imagine from reading all of the intricate writings of J.R.R.Tolkien, the Professor was also a prolific letter writer. Luckily for those of us who seek to understand his inspirations, motives and thought processes, many of his letters contain an abundant treasure chest full of vital information on his works of fiction. More importantly, Tolkien's letters read almost like his wondrous tales themselves. Here in The Letters of J.R.R.Tolkien, the reader is presented with over 350 letters written by Tolkien from 1914 to 1973. We are privileged with insights into intimate family letters as well as lengthy exposé on his works of fiction. There are revelations about Tolkien's writings that appear in his letters and nowhere else. In fact, his letters are often as compelling as his best-selling books. ♦ Read what Tolkien thought of the Disney Studios in a letter written to C.A.Furth, Allen & Unwin on 13 May, 1937. 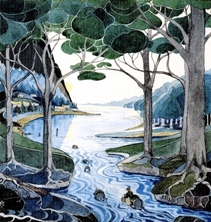 ♦ Read the very touching letter, dated 11 July, 1972, written to Tolkien's son, Christopher, concerning his inspiration for Luthien in The Silmarillion. ♦ Read Tolkien's views on war in a letter written to his son, Christopher, dated 3 June, 1945. ♦ Read the now famous letter, written to W.H.Auden, dated 7 June, 1955, where Tolkien describes his first sentence written about hobbits: "In a hole in the ground there lived a hobbit."